With our experienced skipper armed with great local knowledge, multiple strikes are always possible! The fishing season runs from July to October where the waters are calm and it’s definitely joyful to be greeted by the leaping sailfish! Indeed, take nothing but “photographs”, leave nothing but “memories” in this “CATCH and RELEASE” Sailfish Capital of Asia”! The above video is by compliments of Shajasa and Paul Solway. Provide Fly fishing Gear? No. Please bring your own. 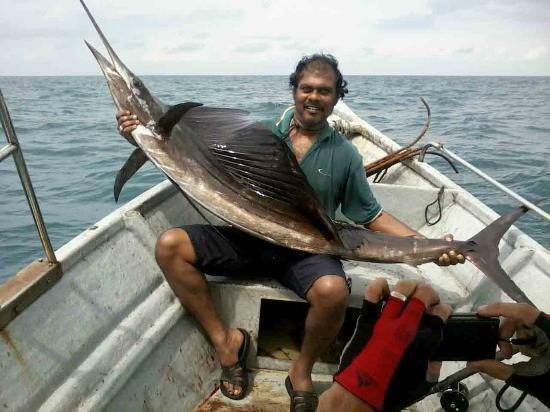 This entry was posted in Malaysia, Peninsula, Star Packages, Tour Packages and tagged day trip, Malaysia Deep Sea Fishing Tours, malaysia tour package, Rompin fishing Tours, Sail Fish Tours, Sailfish Tours, Sailfishing Malaysia Tours, Sailfishing Tour Packages, tour package by fookarmin. Bookmark the permalink.